Reg Pettibone, a full blooded Woodland Native American from the HoChunk Nation, along with his wife Marca, from the Paiute Nation, presents a unique and engaging cultural performance that amazes, entertains and educates audiences throughout the United States. 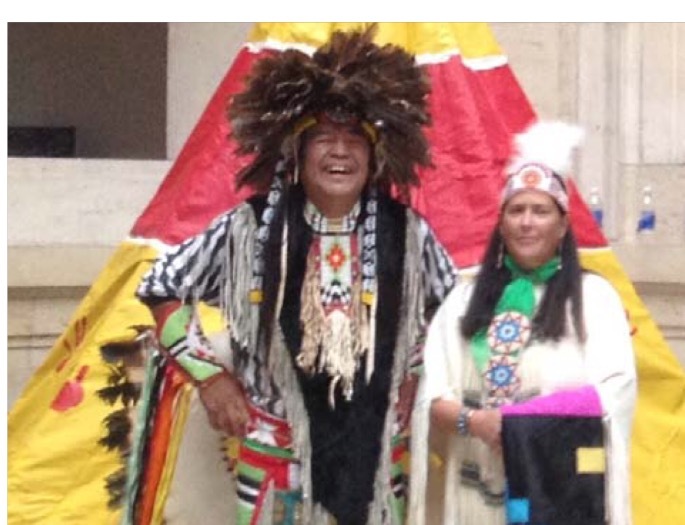 Reg, also a champion powwow dancer, draws on his traditional upbringing to provide the audience with a better understanding of true native culture through dance, song, stories, audience participation and a hand on artifacts display. This highly recommended presentation exposes the audience to their nation’s past and present day culture in a whole new and exciting way! Programs can be designed for specific audiences such as, Preschools, K-12, Universities, Libraries, Theater, Festivals and Events. Reg can also offer a full dance troupe experience with up to 20 performers. Also available are 12′ Tipi Displays, Native Foods, Crafts Making, Games and an Artifacts Display Rental. Multiple show discounts can be applied when applicable.